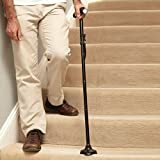 Wet pavements, uneven gravel, slippery grass, steep stairs and shiny floors, the 24hr Safety Walking Stick takes them all in its stride, day and night. The secret’s an extra-wide 360o pivoting ferrule with 4 stabilisers ensuring non-slip reliability. So stable, it even stands by itself, useful when you need both hands free. Adjustable to 5 heights and extending 86 to 96cm long, it folds neatly to slip into a pocket or bag. Made from lightweight aluminium, it features a powerful 6 LED torch that pivots to shine forward into the night, or down for a pool of light, delivering sure-footed confidence in the dark. Complete with soft grip handle and wrist strap.